The Spanish Association of Residents in Preventive Medicine and Public Health (ARES MPSP) is concerned about these discrepancies and their consequences within the European context. Our aim was to characterize the disparities present among the different public health resident training programmes across the European Countries. A survey was developed to this end. 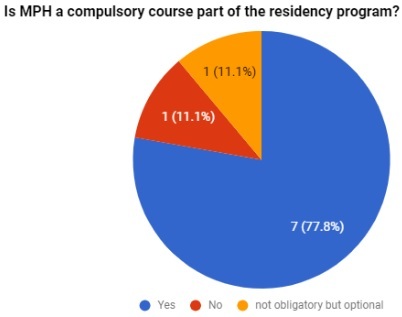 All members present at the Strasbourg meeting, representing eight of the nine countries that are part of EuroNet-MPRH, participated at the survey, which consisted in a single question “Is MPH a compulsory course part of the residency programme?”. Ireland, the remaining country, received the survey via email. 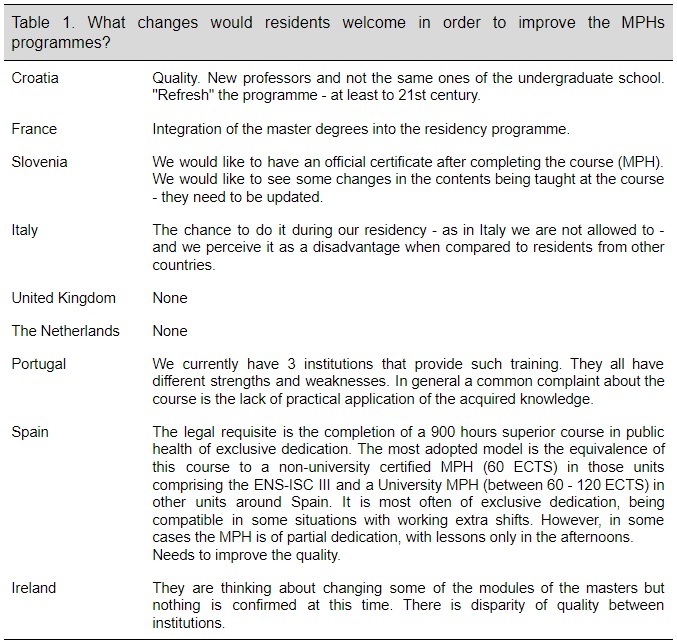 All countries, except Italy and Ireland, declared to have a MPH programme as part of their residency training programme. In Ireland, MPH is optional (See figure 1). Regarding commitment and time-dedication, 33%(3/9) of the surveyed countries reported the presence of part-time MPHs, while 44% (4/9) reported full-time commitment programmes. Fees are more often covered by the employer then students, except in France, where trainees must sustain the fees by themselves. In three countries costs are covered by the ministry. 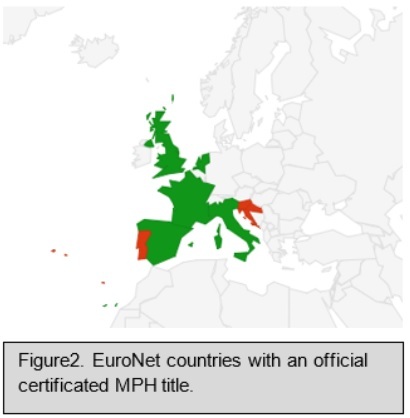 All countries except Portugal and Slovenia have an official MPH title. Although Croatia has an official MPH title, they are unsure about the accreditation status. Schools in Portugal are encouraged to consider MPH programmes as the academic part of a master programme, where students pay an extra fee to present a thesis and to obtain a degree. Slovenia hopes to have one in the future (See figure 2). The residents satisfaction with the training received during the MPH was assessed with the question “How satisfied are you with the training you have received?”. The results show a median satisfaction of 3.5 points out of 5 [IQR: 2-5] (See figure 3). Moreover, residents were asked about what kind of changes they would like to observe inside the MPHs programmes (Table 1). As presented, there are great disparities among different MPH programmes across Europe. It would be desirable to further unify MPH criteria in order to increase training quality and mobility. Inamo J. et al. Existe-t-il des spécificités dans la prévalence et la prise en charge de l’hypertension artérielle aux Antilles-Guyane par rapport à la France métropolitaine ? BEH thématique, 16 décembre 2008 ; 49-50. Romon I. et al. Le poids important du diabète sur la mortalité dans les départements d’outre-mer. InVS, Mars 2007. Carde E. Les discriminations selon l’origine dans l’accès aux soins. Access to health care and racial discrimination. Santé publique 2007, volume 19, n° 2, pp. 99-109. French Guiana – Who is the stranger?